Given the popularity of small SUVs and crossovers it was only a matter of time before Toyota built a hybrid one – and here it is. The Toyota RAV4 Hybrid delivers the same comfortable, easy-driving character of other Toyota hybrids, but in the form of a practical SUV. 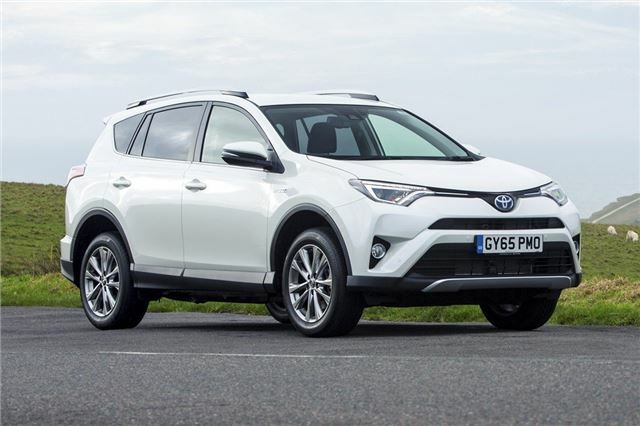 It’s a combination Toyota reckons will account for more than half of all RAV4 sales. The hybrid model comes as part of an overhaul of the RAV4 range – all models get sharper exterior styling, with the same front-end treatment seen on the recently updated Auris and Avensis. There have also been a few tweaks in the cabin, but the biggest news is certainly the addition of the new hybrid, available in front- and four-wheel drive. Power comes from a 2.5-litre petrol engine linked to an electric motor (or two electric motors, should you opt for the all-wheel drive), producing a total of 197PS. Performance is impressive, with 0-62mph taken care of in 8.4 seconds, yet CO2 emissions are 115g/km for the front-wheel drive version and 118g/km for the all-wheel drive model, with respective economy figures of 57.6mpg and 55.4mpg. As with all Toyota hybrids the transmission is a CVT automatic. It’s very smooth and for the most part very quiet but, as with all CVTs, it does get noisy when accelerating hard. Fortunately the RAV4 Hybrid is responsive enough to make light work of overtaking and slip roads, so the usual peace and serenity behind the wheel is only interrupted briefly and occasionally. Around town or when cruising on a dual carriageway there’s very little to complain about – wind and tyre noise are minimal and comfort levels are excellent. Rough roads and potholes are generally coped with very well indeed, making for relaxed progress. Unfortunately this does come at the expense of keen handling on more twisty roads. When pushing on the RAV4 Hybrid is prone to quite noticeable body roll. That, along with the vague steering and a lack of lateral support in the seats, makes enthusiastic driving on a country road far from an enjoyable experience. But dial back the pace and the RAV4 is easy and comfortable which is after all what a hybrid is all about. For most drivers there won’t be much difference between the all-wheel drive and front-wheel drive versions on the road, though in poor weather or when accelerating hard the all-wheel drive version has better traction. The RAV4 isn’t a rugged off-roader – its all-wheel drive system is better suited to poor on-road conditions than treacherous mud, though it will cope with unpaved tracks. It differs from the front-drive variant in that it has a separate, additional electric motor for the rear wheels. Rather oddly it has a much higher towing capacity than the front-wheel drive variant, rated for a 1650kg versus 800kg for two-wheel drive versions. That could very well be the deciding factor for buyer with caravans and trailers. In fact the all-wheel drive hybrid has the highest towing rating of any RAV4 variant including the diesel. The RAV4 has plenty of space inside, with reclining rear seats that are suitable for adults. Up front the seats are, again, comfortable and spacious, but there are some issues with the dashboard layout. The displays and controls are spread across three levels, with some switches bizarrely hidden away, like those for choosing different drive modes. Fortunately the touchscreen system, which includes Bluetooth connectivity, is clear and easy to operate. The materials used are a bit hit and miss too. They are certainly durable and hardwearing, but there’s a strange mishmash of different plastics and finishes that make the RAV4 feel less plush than rival cars from manufacturers like Audi. Fortunately there are no complaints when it comes to luggage space, with a wide, flat load area. Volume is 501 litres with the seats up or 1633 litres with them folded – slightly less than non-hybrid variants. Buyers can choose the hybrid powertrain in Business Edition Plus, Icon and Excel trim levels – the former of which is the cheapest at £26,195, but is only available with front-wheel drive. It comes with dual-zone climate control, navigation, a power tailgate and a parking camera. It’s the model we’d recommend, since the Hybrid is very expensive in Icon and Excel trims, at around £30,000 – though it does have all-wheel drive. If you’re familiar with Toyota’s hybrid vehicles and you’re looking for a larger car, the RAV4 fits the bill perfectly. It delivers all the smooth, easy to drive character buyers have come to expect from Toyota, plus it should prove reliable. But if a hybrid drivetrain isn’t essential there are better choices out there, including the well-finished, spacious and better-to-drive Mazda CX-5 – so make sure to shop around.